European castles are undeniably magical. They fascinate us for so many reasons. Maybe the history and purpose of these ancient fortifications intrigues you and takes you on a journey into the past. 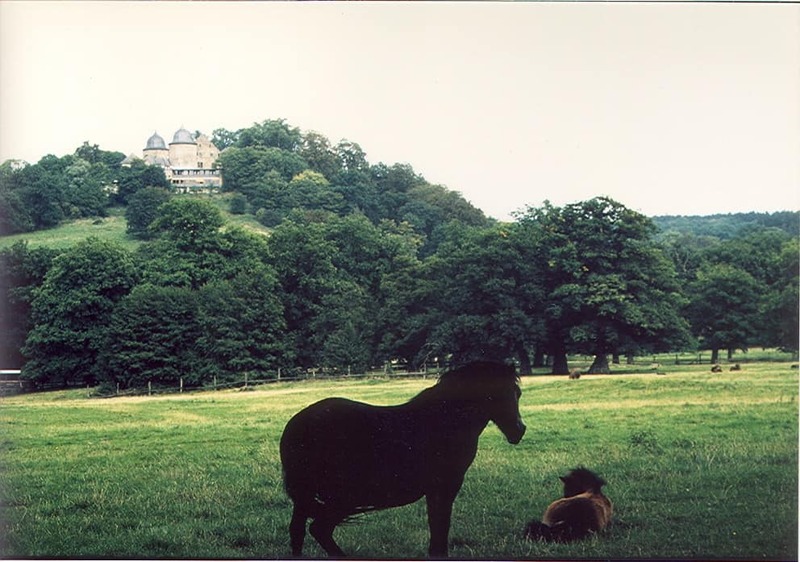 Perhaps castles make you think of knights and princesses, rekindling the fairy tales you were so often told as a child. Or it could be that you’re simply fascinated by their striking architecture. For a myriad of reasons, castles are a major draw when it comes to tourism. They certainly are for us, anyway. We spent part of our Wales road trip chasing down the best castles, and there are hundreds more to be found in the UK. Mainland Europe is also bursting with castles. We’ve seen several in Austria, Prague, and Romania. But if you’re looking for the mother lode of castles in Europe, Germany might be the country for you. Germany is home to 20,000+ castles, according to some sources. Which means you can spend an entire lifetime exploring them all. But who’s got that kind of time? Instead, we’ve streamlined things for you. Several of our friends collaborated with us on this post to bring you a short list of the very best castles in Germany. These 16 castles, palaces, and even a monastery, are some of the finest in the country, and range from the grandest and most famous to those lesser-known gems. With this list, your castle tour of Germany will be a success. Ready to find your real life fairy tale? Read on. Neuschwanstein was the dream castle of King Ludwig II. Built during the late 19th century, the Romanesque building makes it look like a romantic fairy tale castle. It has been an inspiration to many, including Disney’s Sleeping Beauty Castle. We were so excited to get a chance to visit this amazing castle! Ludwig was thought to be living in his fantasy world. He was a very shy dreamer with a sense for the artistic. He dedicated Neuschwanstein to Richard Wagner, a German composer. Ludwig was very interested in Wagner’s work, and his operas seem to have served as an inspiration for the castle. Inside the castle you can see the wonderful scenes inspired by the medieval themes that Ludwig loved so much. The interior is absolutely stunning, it was so impressive to see in real life. Many people on our tour group were impressed as well by the technological advancements that were incorporated into the castle. Ludwig loved the medieval arts, but he was also very pleased with his late 19th century’s comforts! Ludwig never got to see his dream castle completed, because he died while construction was still in progress. The ruin of a castle on the site opposite was bought by Ludwig’s father King Maximilian II to build a new castle for his family. The setting of the location is very beautiful and it was considered a good area for hunting. 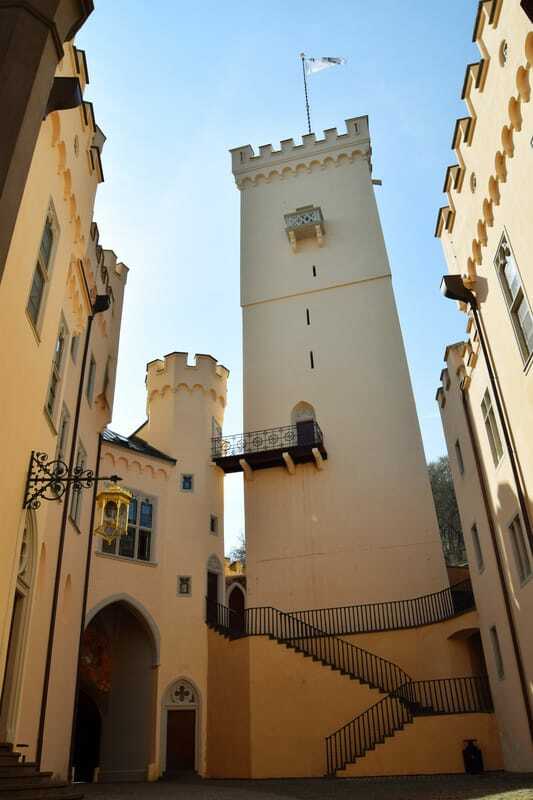 The yellow Hohenschwangau castle is built in the 19th century a little before Neuschwanstein and was supposed to look similar to the medieval castle that used to be on its same location. This is the castle where the Bavarian Kings had actually spent time; it used to be their summer residence and Ludwig had probably had some happy childhood years there. What we found very interesting about Hohenschwangau was that the family had actually lived there for certain periods of the year and therefore it had been a working castle. Everything was still in a good state and we got to see a lot of the castle, so you could really imagine what life might have been like for the royals that used to live there! 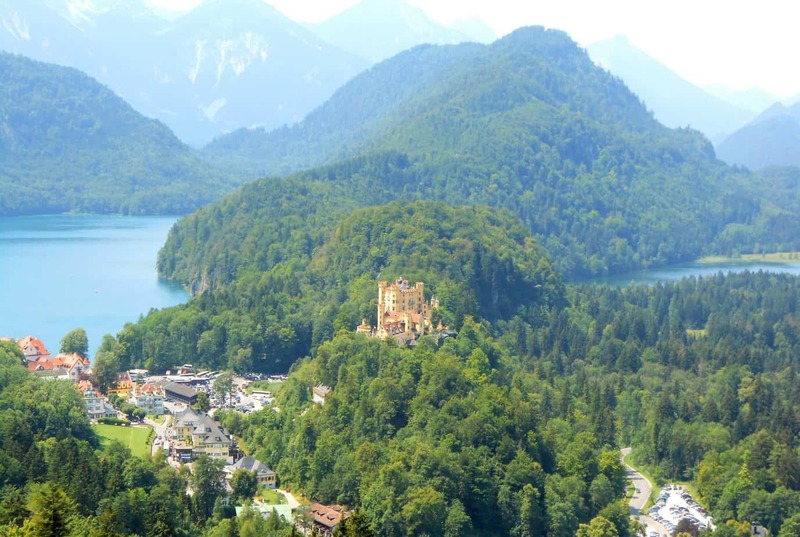 –both Hohenschwangau and Neuschwanstein were submitted by Rianne of Sunny Journeys. She also provides the following additional information, helpful for those visiting these two castles in Bavaria. Both Neuschwanstein and Hohenschwangau are situated close to Füssen, which has a train station and there is a public bus service (info in German and English) to the area of both castles. Füssen might be worth a short visit of its own, if you have the time available. The castles are literally walking distance apart, so you can easily visit both in one day and there are different combo discounts available if you do so. Hohenschwangau was very different to Neuschwanstein, and doesn’t get much attention at all, but I think it was worth a visit too! 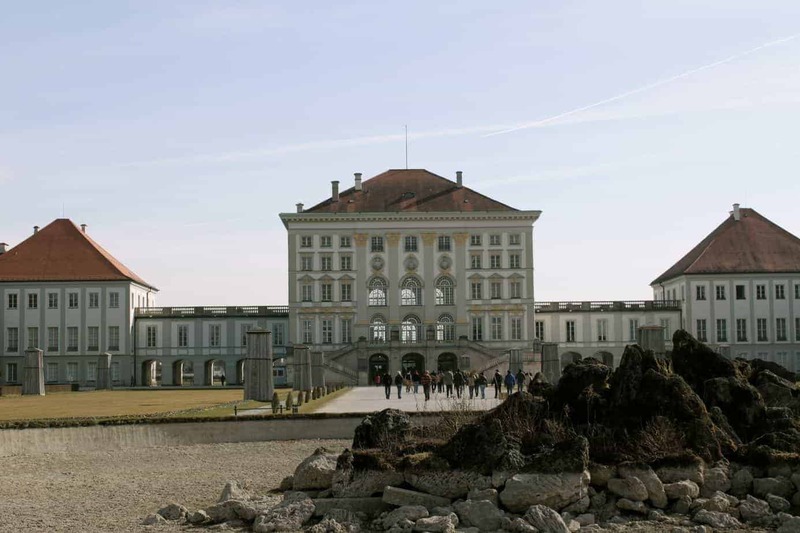 I would advise to visit the Museum of Bavarian kings only if you are interested in their history. If you visit during high season, make sure you arrive early as there’s a long line for tickets and they sell out within a few hours! You could still admire the castles from the outside, but that’s probably not the only reason you made your way there. On our first attempt to visit, we made the mistake to arrive around lunchtime, so time slots to visit Neuschwanstein were sold out already. As we were staying nearby, it was easy to come back right at opening time the next day when the line wasn’t so long yet. If you’re a German castle fanatic, you need to visit Rhine Valley for its many awe inspiring castles. This gorgeous region, only a short drive from Frankfurt, produces some of the most famous white wine in Germany. You’ll also find hundreds of castles. My favorite in Rhine Valley was Schloss Stolzenfels, which was the Gothic-Revival renovation of a medieval castle by the King of Prussia. It may not be the most famous castle in Germany, but it is a castle straight from a fairy tale. Stolzenfels’ view over the valley as well as its ornate gardens make it one of the most spectacular German castles for couples wanting to have a romantic weekend. Unlike some other castles in Germany, it is not overly crowded and only costs 5 euros. Castle Eltz is one of those castles that you imagine in a story book. It’s a bit further away from Rhine Valley than other castles, but it is worth the trip. While driving down country roads, you’ll keep seeing signs until you reach a parking lot. It’s a short bus ride from the parking lot and/or picturesque walk through the forest until you reach the castle. Eltz castle originally had separate buildings belonged to a few families, however one of the original families now owns all the buildings. The family still keeps one of the towers private as part of their private apartment, which makes this castle quite different than others that I’ve visited. In particular, it feels less medieval, and more like someone’s really luxurious apartment that happens to date back hundreds of years. Anyone considering a day trip can easily make a weekend trip of visiting the nearby Mosel Valley and/or hiking on the grounds. -both Eltz and Stolzenfels were submitted by Karen of Wanderlustingk, an Amsterdam-based travel blogger. Check out her tips for visiting the Rhine Valley on a budget. More stunning photos of Eltz & a few tips here. 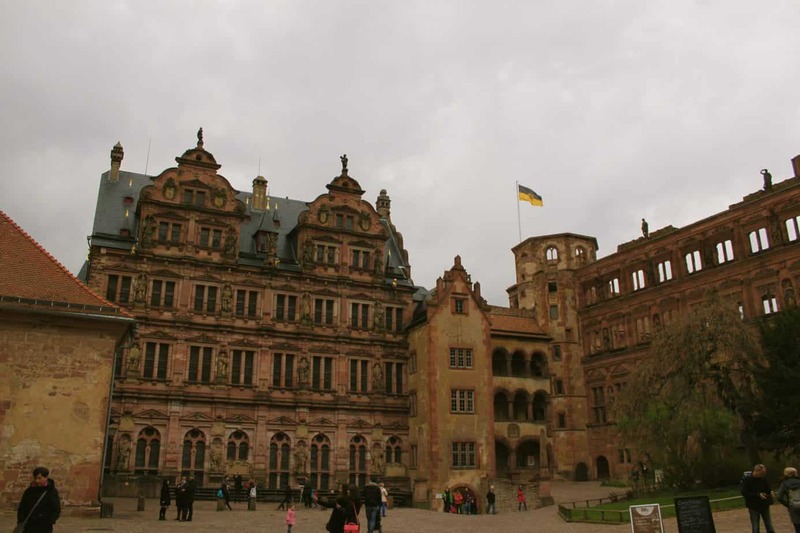 Heidelberg Castle, located within walking distance of Heidelberg’s downtown area, is a beautiful partially rebuilt castle that sits on the side of a hill overlooking the beautiful old town. While I have visited multiple castles in Germany, this castle stole my heart. It isn’t the best preserved or covered in paintings, but its gorgeous pink stone and partial demolition gives it the feeling of wandering into a forgotten land. Plus, there’s a kitschy stop in it for you. Heidelberg contains the world’s largest wine barrel; it holds 57,853 gallons! It’s so massive that you can climb stairs and wander around the barrel on a deck that surrounds it. Who wouldn’t want to see that? Kaiser Wilhelm II once declared, “The view from the Hohenzollern Castle is truly worth the journey.” That’s a pretty good recommendation! He was probably right; this photo of Hohenzollern is enough to make anyone want to pack their bags and hop a plane. Burg Hohenzollern was built somewhere between 1846 and 1867. 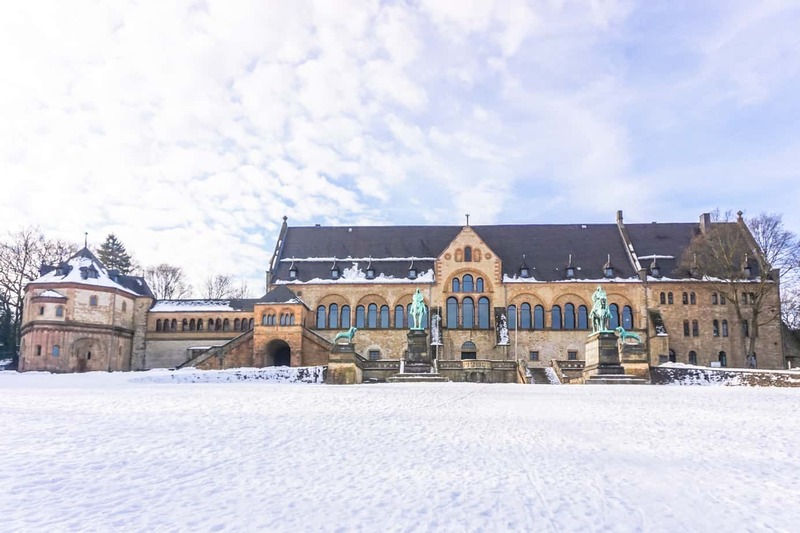 This site is the ancestral seat of the Imperial House of Hohenzollern, and the present day structure is actually the third castle built on the spot. 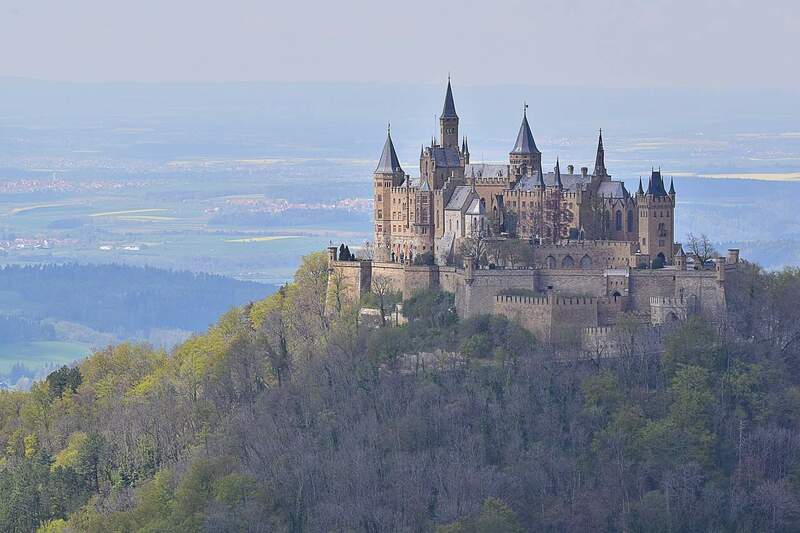 The castle, set alone atop an impressive hill, is one of the most visited castles in Germany. Highlights include St. Michel chapel and the famous Hohenzollern Crown, a decadently bejeweled piece which is adorned with, among other gems, a diamond cross,142 rose-cut diamonds, and a massive sapphire. 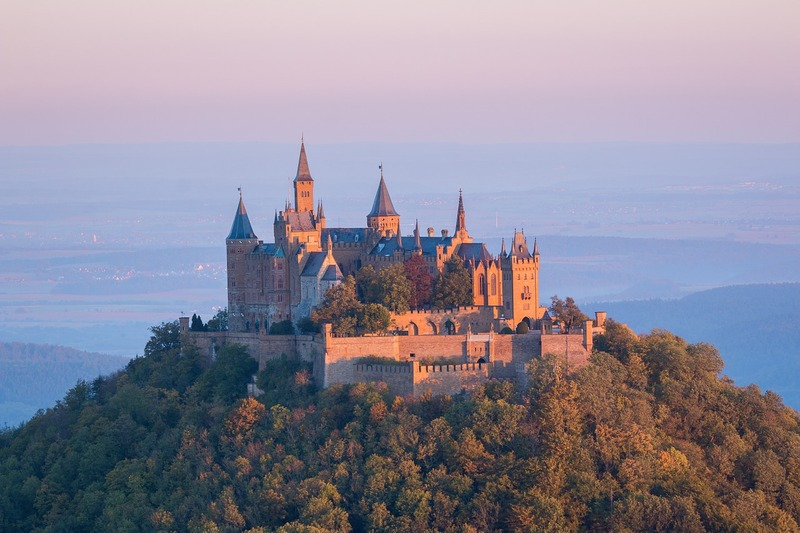 Hohenzollern Castle is accessible from the city of Stuttgart, an hour train ride away. A bus can take you to the parking lot and you can continue a 20 minute hike to the top. Currently, entry to the entire castle complex costs € 12.00. Germany, just as the rest of Europe is full of beautiful castles and palaces. One of the most beautiful palaces of Germany is found in Potsdam, a small town situated at 20 km from Berlin (it takes 30 minutes to get there by suburban train). Potsdam was declared UNESCO World Heritage Site and is also famous for hosting the famous conference between the leaders of the allied nations in 1945. There are more than 500 hectares of gardens and around 150 palace style buildings in Potsdam. The most beautiful buildings are found in the Sanssouci Park. 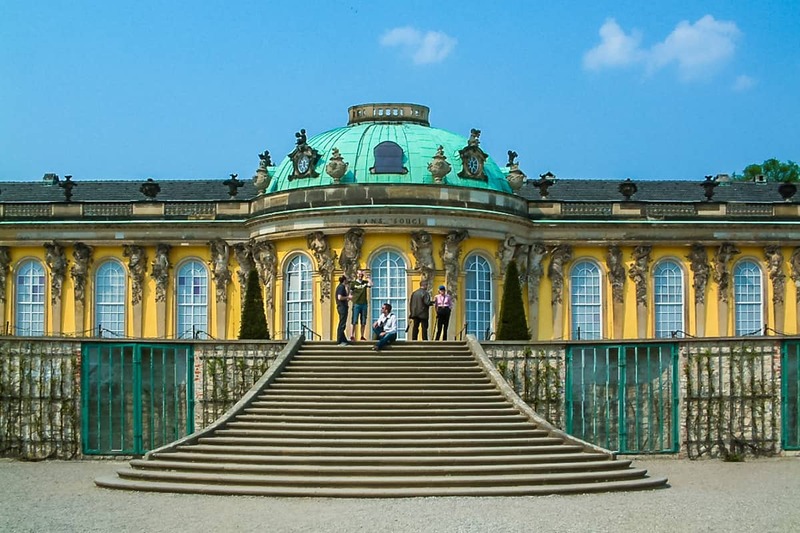 Sanssouci Palace was Frederick the Great’s summer palace and was built in rococo style. You can find fascinating decoration in the interior of the palace. The concert hall (Konzertsaal) is especially impressive. It’s worth walking around the park to visit some other emblematic buildings such as the New Palace, the Neptune Grotto or the Temple of Friendship. My family visited this castle as part of an exploration of Germany’s Fairy Tale Road. Located very near to Munden and Gottingen, this isolated 600+ years old castle is situated deep into the forest, off the main road. Also known as Sleeping Beauty’s Castle, it was turned into a hunting lodge in 1765 and frequently visited by the Brothers Grimm. Like many castle hotels, it has rooms in both the original section (in this case a romantic tower) and a newer wing. The modern rooms have been skillfully added on to part of the castle ruins. An animal park below is populated with beasts boasting very old lineages and extends for as far as the eye can see. It is Europe’s oldest animal park/zoo, and I recommend a visit. Many castles in Germany require you to take a trip out into the country. However, Nymphenburg Palace is right smack in Munich, Germany. While it doesn’t have that same Disney look to it that other, more famous castles have, it is still very pretty. It was the summer home of Bavarian Royalty. I was there in the winter, so the fountains were empty (as you can see from my photo) but you can tell that they’re built up to have that natural, beautiful look. The palace is a more simple baroque style, but there are some really beautiful gold details around the main entrance of the palace. I can totally picture myself lounging on a chaise lounger in front of those massive windows on a warm summer day. Because it’s in Munich, no day trip is required. Simply hop on a bus or call a cab and explore! Schloss Marienburg was built by King George V of Hannover for his wife, Queen Marie for her birthday. It is one of the few remaining castles in Germany, unaffected by war and still holds all of its original interior furniture. The pieces are immaculate, and the secrets they hold are incredible – only accessible through a private tour, the guides are able to describe the furniture, their meaning and purpose. Much of the exterior architecture reminds me of Disney-princess castles; even the toilets behind the main building are surrounded beautiful towers and carriage doors. Schloss Burg is the largest reconstructed castle in the state of North-Rhine Westphalia. It sits nicely atop a hill in the corner of Solingen. Within the castle walls, the court yard holds various torture devices to test out. Inside, the castle is filled with recreation furniture, and suits of armor. The main sitting area within the castle holds re-enactments and children’s puppet shows (In German) to teach the children a little bit about castle life. 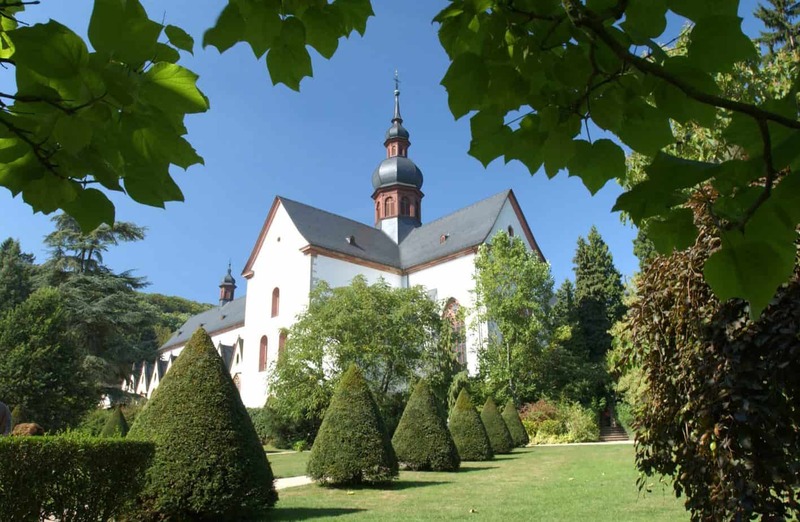 Eberbach Monastery is one of the first places to start the production of Pinot Noir in Germany. There is a sense of going back in history as we strolled through the timeless Roman arches of the monastery. The Cistercians had a very simple lifestyle and it is evident from the strong wooden arches with bare furnishings. The church is central to the workings of a monastery and the Roman architecture will make you fall in love with its simplicity. The dining hall of the Lay brothers is where all the action used to take place. The wooden wine presses of the 17-19th century are still visible. Although the monks were known for their austerity, but the Baroque period saw the monks showcasing their worldly wealth. The Baroque residence was one of the most elegantly decorated rooms in all of medieval Europe. The richly decorated ceiling takes your breath away. The best way to get here is by the Bus. 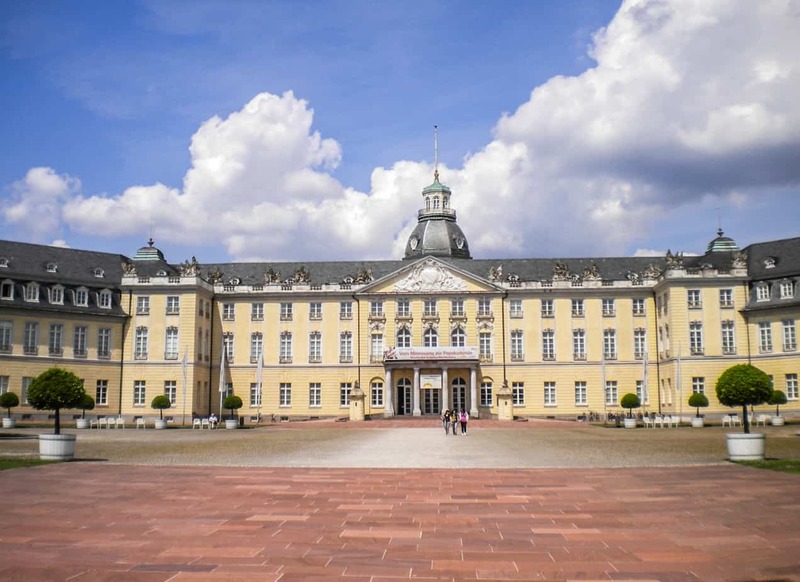 Karlsruhe Schloss is a highlight and the center of the Karlsruhe city. It was built in the beginning of the 18th century and served as a residence for grand dukes of Baden for almost 200 years. 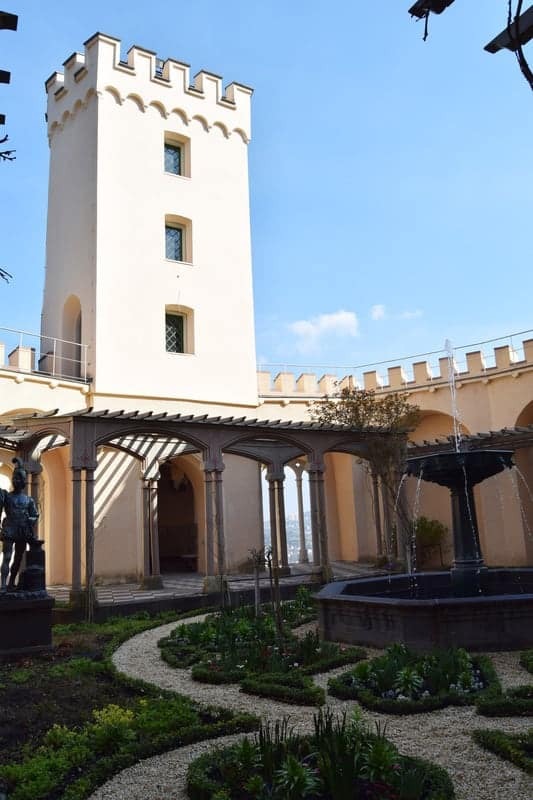 There is a Baden State Museum with the art, history and cultural heritage of Germany and Baden-Wurttemberg state since ancient times and also a park with a lake behind the palace where you can see many local citizens enjoying summers. There are parts of the building that were destroyed in 1944 and it was decided to reconstruct the exterior part according to the original sketch and adapt the interiors to the museum necessities. If you pass Karlsruhe on the way while traveling in Baden-Wurttemberg, it’s worth spending half a day or more to relax or take a bike ride around the center. Kaiserpfalz Goslar (known in English as the Imperial Palace of Goslar) was built in the 11th century and used as a summer residence by the Holy Roman Emperors until the 13th century. Included as part of the UNESCO World Heritage city of Goslar, the palace was the largest secular building of its time. Art historians consider it one of the best examples of 11th century architecture. Additionally, the grounds of the palace are home to cathedral remnants, churches, and chapels. After the palace was abandoned in the mid-13th century, it remained in disrepair until the 1860s. 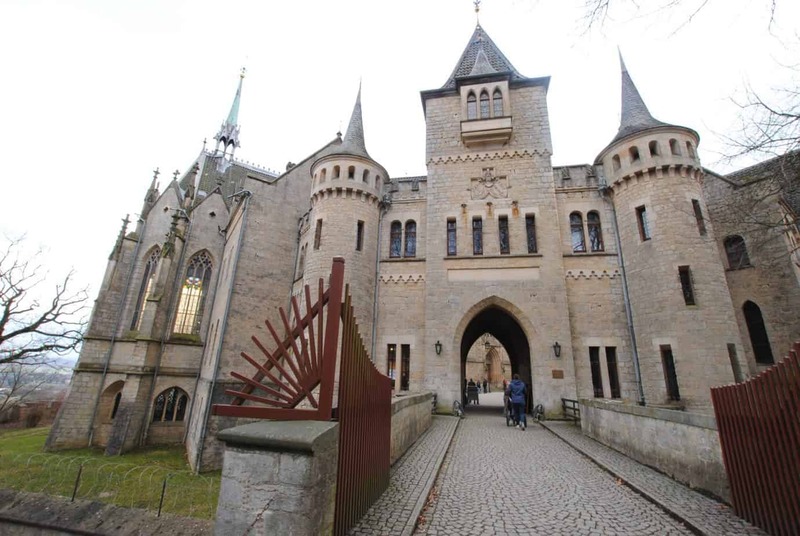 It has now been fully restored and remains one of the main tourist destinations in Goslar. The Imperial Palace is easily accessible by car, train, and bus. 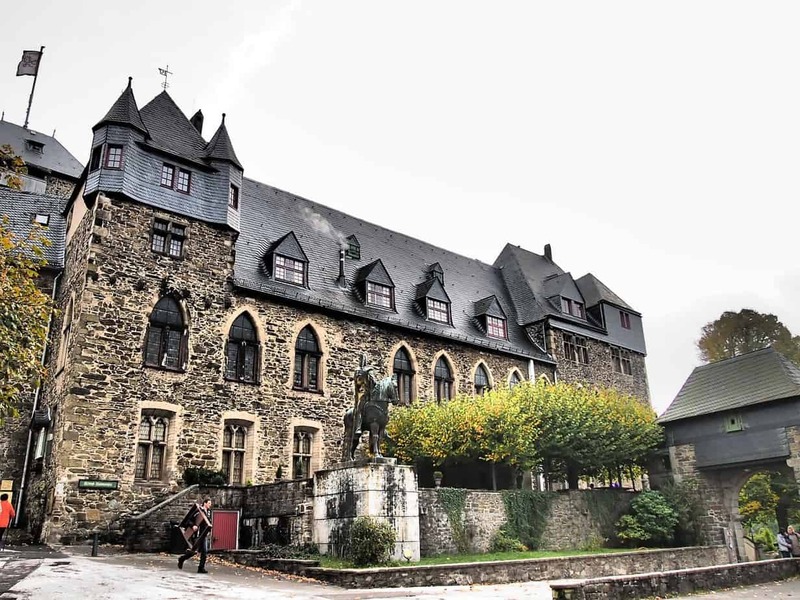 Located in the heart of Goslar, Germany, it is along major transportation routes. It is open year round with limited hours during the winter months. Schwerin Palace is one of the most important works of romantic historicism in Europe and is currently awaiting for their UNESCO World Heritage Site designation. It even serves as the local state’s parliament. 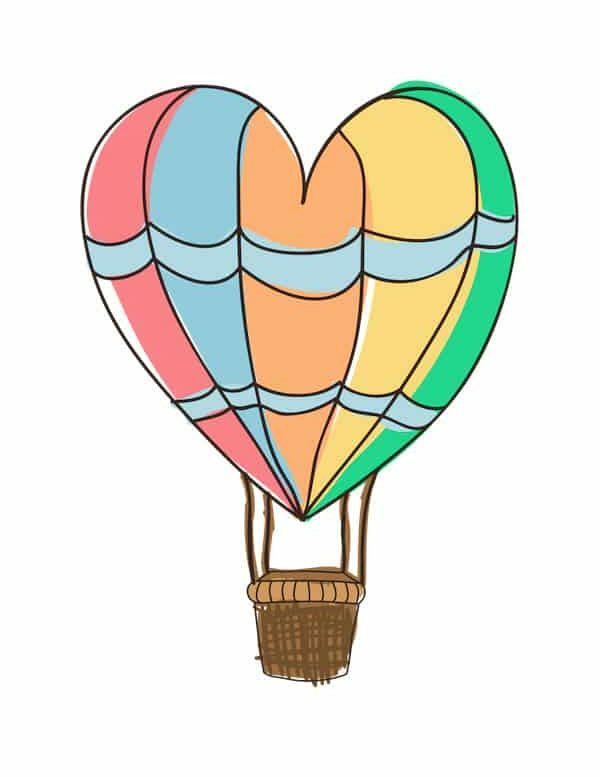 The place literally oozes romance – situated on its very own island, its surrounded by a lovely garden and park. The park or Burggarten,has an orangery overlooking the water, a conservatory restaurant and terrace café. There are also sculptures, fountains and even a grotto. The Schlossgarten is with several canals, more statues, gazebos and other more modern touches. Schwerin Palace is an easy place to lose track of time, as you might end up spending hours wandering around the castle and the surrounding area. Schwerin is a perfect day trip from Berlin and can be easily reached by bus, train, or car in just over two hours. 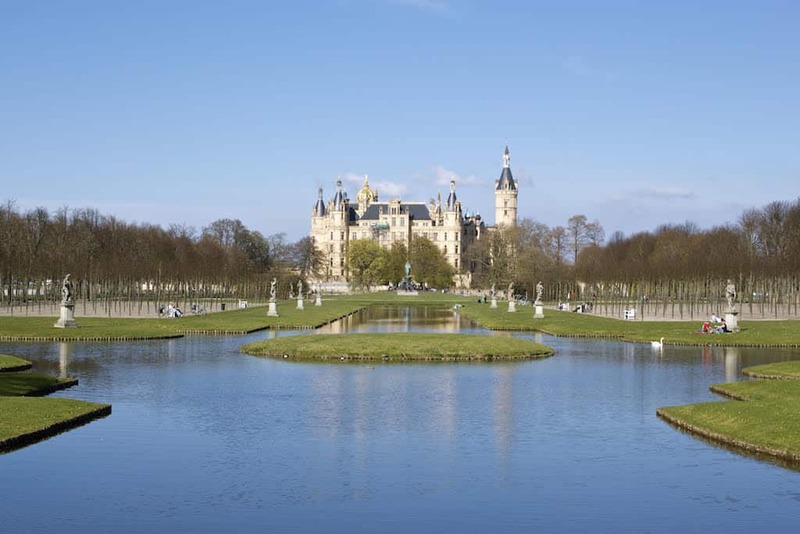 For more tips about what to see and do around Schwerin, see this post. Schwerin Castle is also a good day trip from Hamburg. Check out this list of 20 fun things to do there. Linderhof Palace is a Bavarian castle which was built by King Ludwig II. You may remember Ludwig as the king who also commissioned the building of Neuschwanstein Castle. While he did not live to see Neuschwanstein finished, he did get to enjoy Linderhof. This ornate and luxurious palace is actually fairly modest in size. Yet it’s splendor makes up for whatever it may lack in size. Linderhof’s most interesting feature may be it’s illuminated Venus Grotto, a cave-surrounded lake with waterfall which reminds one strongly of scenes from Phantom of the Opera. 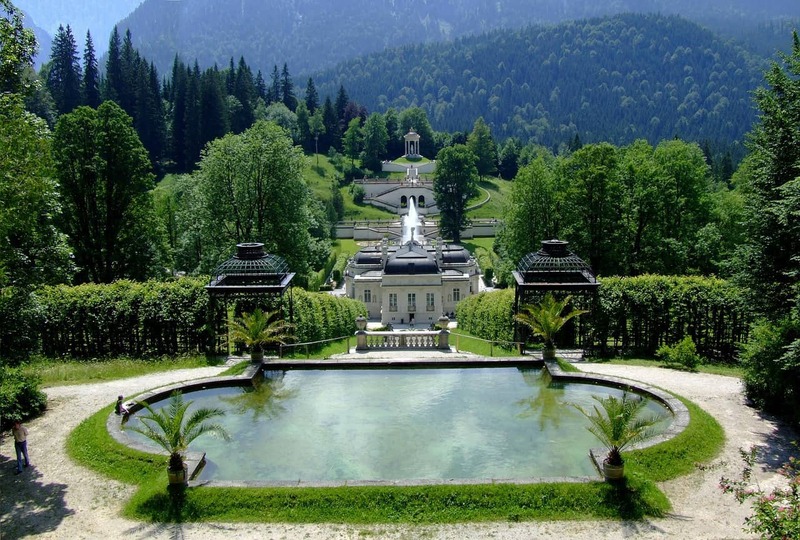 Schloss Linderhof is just over an hour south of Munich by train, and easy to get to. 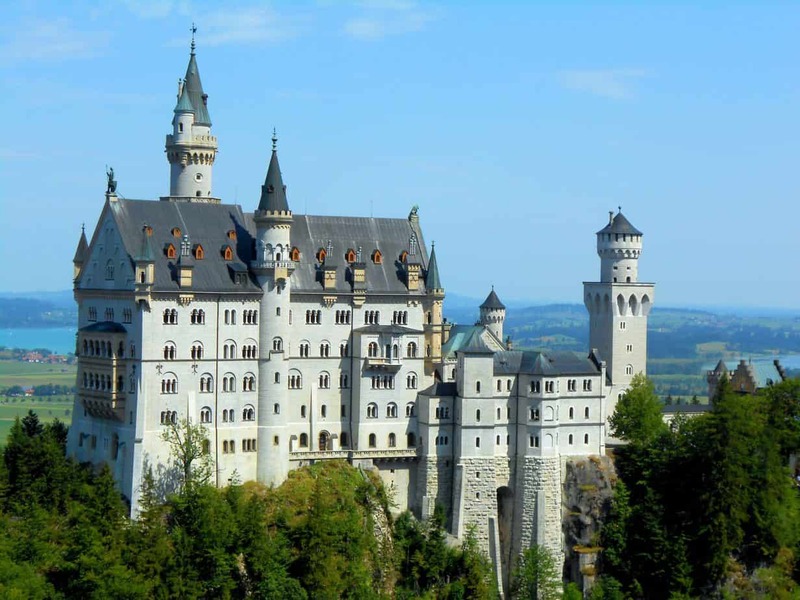 This popular day trip from Munich can be made in combination with tours of Neuschwanstein as well. Admission to the castle, and one of its guided tours, is currently €8.50 (€7.50 in the winter when the garden structures are closed). This is a gorgeous area of Germany. For more photos and inspiration on the region, check out this post on the Bavarian Alps. Planning a trip to see Germany’s best castles? Pin this post to save for later!